The 3rd stop of the Red Bull Crashed Ice World Championship returns to the roots of ice cross downhill, which began in Stockholm 11 years ago. This event takes place in the quaint ski town of Are, Sweden, where contestants face the one of the fastest tracks ever built– 420 meters long with a vertical drop of 60 meters. 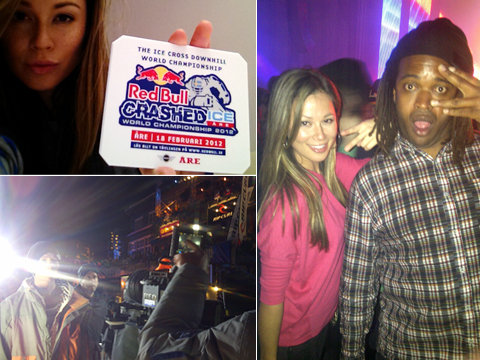 You can find Sal Masekela and Mayleen Ramey in thick of the action, as host and sideline reporter for the Red Bull Signature Series, airing on NBC. Some call me a jet-setter, wanderlust, even a gypsy...these are pretty accurate. But my new favorite word is "ferweh"-- a desire to travel, a longing for far-off places. The German translation literally means "farsickness", the opposite of being "home sick". I've been flying and moving since I was born. Another favorite travel term of mine is "Third Culture Kid", which is a child that has parents of different cultures and grows up in an entirely different one; that's me, sort of. My parents are American & Chinese, but I was raised in Turkey, Ecuador, Zambia, Malaysia & America. Which understandably is why, I feel the most at home when I'm traveling. Thanks for stopping by & following my adventures in TV, tennis & travel. Happy journeys! Thanks for your message! Message sent.